Identification: Upperside is brown; forewing with large, dark-edged clear spots. Male has no costal fold. 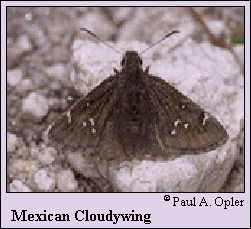 Underside is mottled brown and black with grayish outer margins; hindwing with brown striations. Life history: To wait for females, males perch on or near the ground on hilltops. Females lay eggs singly under host plant leaves. Caterpillar hosts: Clover (Trifolium), wild pea (Lathyrus), and vetch (Vicia). Habitat: Alpine and subalpine meadows, slopes, and clearings. Range: High elevation mountains of the western United States south into Mexico.